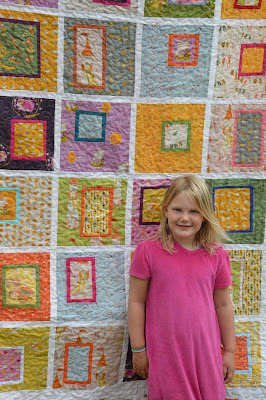 Our feature today is from one of our favorite quilters in blogland, Kristie from ocd: obsessive crafting disorder. She's awesome. And we love her projects. Today's is no exception, a princess quilt for her princess. It's hard to go wrong with Heather Ross fabrics too! Kristie has a great design for design, layout, colors, ya know. For some eye candy check out her finishes and tutorials/patterns. It's been 2 years since I bought my Far Far Away 2 fabrics. 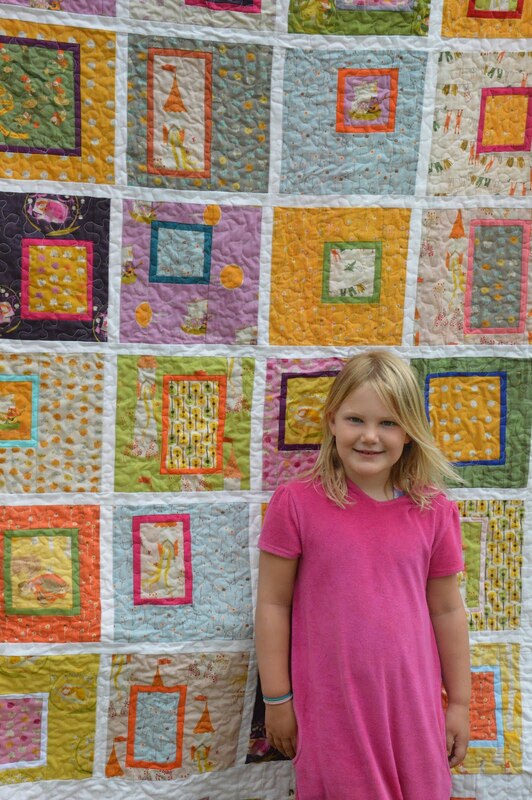 And one year since I promised a birthday quilt for The Middle Child. And 6 months since I started the quilt. Anyways, it came one year plus a couple weeks after the birthday deadline, but all was forgiven when I presented her with her own very Mama-made special quilt :) My girl is now SEVEN, and full of fairy tales and fashion and make believe and creativity and helpfulness and caring and so many wonderful attributes. I lucked out getting this kid, I tell you, she is so much more than the sum of the best bits of her dad and me. Love her to pieces. I finished the quilt while away at the cabin, and spread it out on the grass and had her sister lead her over with closed eyes for the unveiling. Big grins from ear to ear! She spent time studying all the blocks and declared the owl running away with the underwear as a favorite, along with Rapunzel. For the top, I used Kate's Fussy Cut Fairytales pattern, which I modified to make twin size. It is a great compliment to these fabrics, and I adore the distinctive floating border! 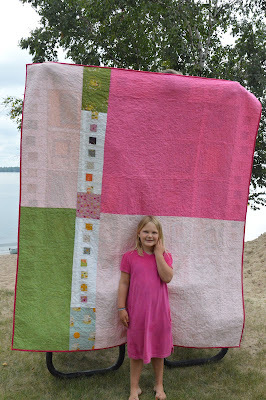 On the back I used some leftover pieces and pieced them together with blocks of pink and green solid. I quilted with an overall stipple. Man, it was a heavy quilt to move around given all that linen content in the Heather Ross prints! 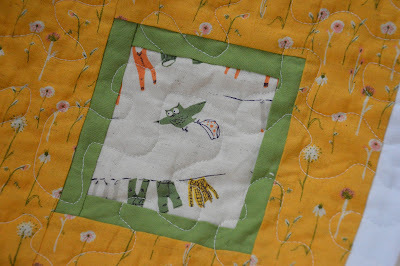 The quilt was hand bound in a Kona solid. Don't ask me to remember which one. It made a nice and cheery frame! She loves it. I love it. I really do think it is my favorite quilt to date. And it looks fantastic on her bed. Just need to make a matching sham or two! 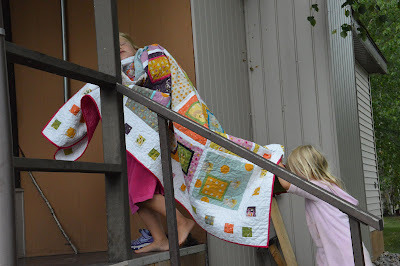 And the sweetest part was, that night as she tucked her in snugly under her new quilt, she said, "The thing I like best about my quilt is that you made it for me, Mom!". A true princess. yay! 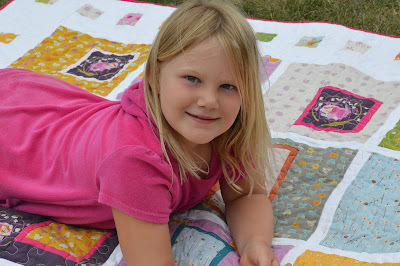 I love Kristie and I love this quilt - thanks for featuring her! 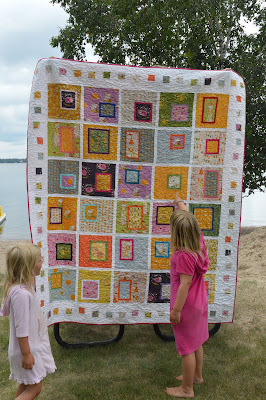 Beautiful quilt and what lovely girls you have!! Nota-se que seu trabalho é feito com muito amor, parabéns! This quilt is so pretty and is obviously a treasure to your daughter already. Aww!! what a sweet girl! 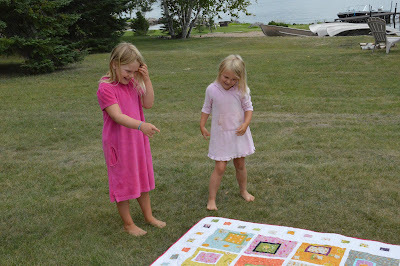 Love her quilts and these adorable girls of hers! What a darling quilt. Just love everything about it! That quilt is fantastic! what a wonderful Mom you are...your daughter is BEAUTIFUL!! !